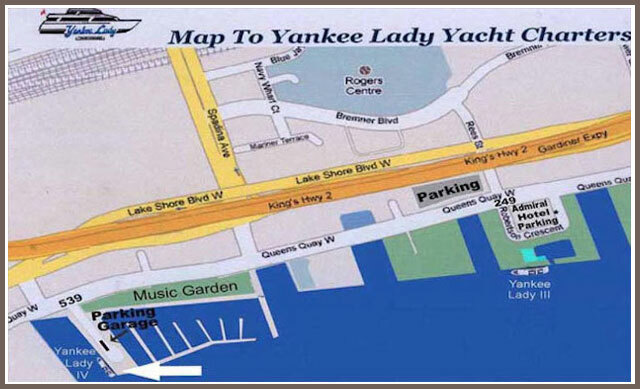 Maps to find your Yankee Lady cruise boat, make sure which one of our ships your cruise is on at time of booking. Before going to your cruise make sure you know if it’s on Yankee Lady III (3) or IV (4) as they have two very different addresses at the harbour. Yankee Lady III (3) is located at 249 Queens Quay W. in front of the Radisson Admiral Hotel to the right of the Marine Police Station at the foot of Rees St.
Yankee Lady IV(4) is located at 539 Queens Quay West on the west side of Quay West Marina at the foot of Bathurst St. in the Portland Slip. You can use the custom Google Map (below) to find the location of your cruise boat and our office and to get directions from your Location just click on the Ship Icons for details. Located at 249/259 Queens Quay West directly behind the Radisson Admiral Hotel and the Marine Police Station at the foot of Rees St.
Take the QEW or 427 to the Gardiner eastbound, exit at Lakeshore Blvd and continue on Lakeshore to Rees St. Turn Right. Yankee Lady III is docked behind the Police Station/Radisson Hotel. Parking: 3 levels under the Radisson Hotel, street level meters behind the Radisson Hotel and a large Harbourfront outdoor lot on the North west corner of Queens Quay and Rees St.
Take the Don Valley Parkway southbound to the Gardiner Expressway west and exit at Yonge St., continue west on Lakeshore Blvd and turn left at Rees St. Continue south to Queens Quay. 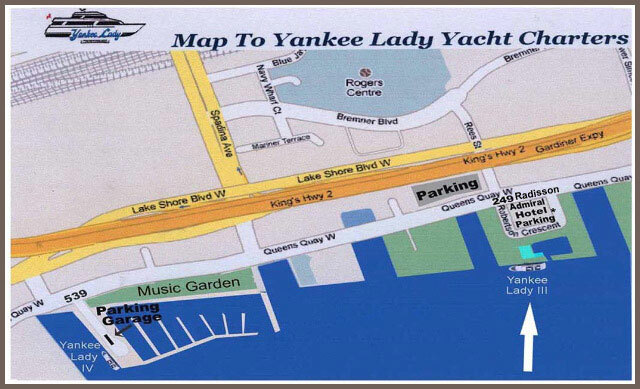 Yankee Lady III is docked in front of the Marine Police Station.Parking is under the Radisson Hotel or on the NW corner of Queens Quay West and Rees Street. Take Lakeshore Blvd. west to Rees St., turn left and continue South to Queens Quay. Yankee Lady III is located behind the Marine Police Station. Parking: 3 levels under the Radisson Hotel, street level meters behind the Radisson Hotel and a large Harbourfront outdoor lot on the North west corner of Queens Quay and Rees St.
Take the subway to Union Station and take the Streetcar (either the 509 or 510) to Rees St. Walk across the street and along the pathway on the west side of the police station. Located at 539 Marina Quay West on the west side of Quay West Marina at the foot of Bathurst St. in the Portland St. Slip. Take the QEW or 427 to the Gardiner eastbound, exit at Lakeshore Blvd. Continue east along Lakeshore Blvd. to Bathurst St. Turn right and then turn left at the lights on to Queens Quay, continue to the first driveway past the inlet and turn right. Yankee Lady IV is docked at the end of the pier on the right. There is a Harbourfront parking garage at this location. Please note there is limited parking due to construction on the parking lot. Take the Don Valley Parkway southbound to the Gardiner Expressway west and exit at Spadina, and take the Lakeshore Blvd exit, continue west on Lakeshore Blvd. Turn left at Dan Leckie Way then turn left at Queens Quay then right on the first driveway. There is a public Parking garage at this location. Please note there is limited parking due to construction on the parking lot. Take Lakeshore Blvd. west turn left at Dan Leckie Way then left at Queens Quay and right at the first driveway. Please note there is limited parking due to construction on the parking lot. Take the subway to Union Station and take the 509 Streetcar to Dan Leckie Way Walk south to the water’s edge. Yankee Lady is the large white boat farthest from the street. At all times there is limited parking at the waterfront. While there are parking lots adjacent to both of our ships, there is no guarantee that there will be space. Please come early. There is additional parking at the Metro Convention Centre (entrance on Lower Simcoe St) and two lots near York St.